Sarah Whitney earned her first byline as a fifth grader when she won a children’s writing contest sponsored by the Hayner Public Library District in Alton, Ill. She still remembers the crisp smell of the $50 award check, but it wasn’t until college that she seriously started writing fiction. While reporting for Eastern Illinois University’s daily college paper, she became inspired after an interview with Dr. Fern Kory, a children’s and young adult literature professor. The interview sparked an on-going dialogue about YA fiction, During this time, Sarah’s YA fiction won two consecutive Louise Murray Awards for Children’s Literature. She graduated with a bachelor’s in journalism after a 14-day class in England. 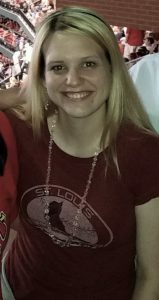 In the last 10+ years, Sarah has worked as a reporter for The St. Louis Suburban Journals of St. Charles and Warren counties where she created relevant, timely and award-winning content for her readers using her writing, social media, video and graphic design skills. She has also served as the Publicity Director for the Missouri Writers Guild where she promoted the organization’s annual writing conference. She currently leads the marketing department for a national plaintiffs’ law firm with more than 80 attorneys and six offices nationwide. Contact her at sj.whitney26 <at> gmail <dot> com. Last night I lit a charcoal grill and cooked burgers for the first time ever. Now, I’ve helped with prep work before. But, the hubby has always been the one to get the grilling honors. In fact, he’s a bit of a mad scientist when it comes to his charcoal grilling or smoking techniques. Whenever we’re at parties or at the in-laws he’ll regale everyone in sight about his most recent grillin’ adventure. This works out for me as I love to eat. He cooks. I clean. It’s a good arrangement as I’m OCD and he’s not. Sadly, however, my chef has been away on a business trip all week. Tuesday was the perfect weather for grilling. I thought about it, but didn’t. You ever have those days? Then, when Wednesday night turned out just as nice, I decided it must be a sign from the grillin gods.